Discussion in 'Beer & Food' started by in the trees, May 8, 2008. Anyone have one? Brand? Opinions? Fuel type? Thanks. I had one but had to leave it during the move. It was pretty sweet once I figured out the nuances the smoker (how to control temp mostly). It was a CharKing with the side fire box. We loved it & used the hell out of it. As for fuel....oak, hickory, maple, mesquite, cherry...wahtever you can get your hands on is good. There are different kinds. 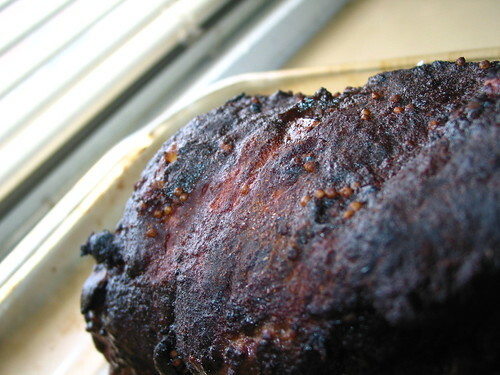 Cold smoking can be done on the cheap with a hotplate and a large cardboard box and a thermometer. I've never tried it but I've seen it done. Hot smoking, or BBQ can be done on a good grill with a steel tray and some wood chips. I own a Char-Griller Smokin' Pro offset. Works great as a grill or a smoker. Made some mighty tasty BBQ on that thing. A Weber Bullet is a good, relatively inexpensive way to get going and keep going, they're even used by a lot of pros at comps. Anyone own a smoker? Thanks. I had one for a while for yard work... but then he escaped last year and went back to Canada. He used to leave his butts in the sh!tter all the time.. disgusting! i have no idea what i'm doing & look forward to knowledge being dropped, like where does the smoke come from? the lava rocks in the bottom chamber? old wasp nests? Brand? Opinions? Fuel type? Thanks. I have a Big Green Egg and it kicks A$$. It's a grill and a smoker, runs on only charcoal (hardwood, not the insta-light unless you like the taste of petrol). Because it is ceramic it's very well insulated, it works very well in all temps including below freezing. It takes me a couple months to use up a 20lb bag of hardwood charcoal (thick ceramic walls hold in heat, uses far less charcoal than something metal). When smoking you can use a SMALL amount of wood like mesquite or hickory to give say some ribs a better flavor. Be careful how much wood you use or your food will taste like sap. The great thing about the Egg is it grills up fish, steak, chicken really well too, it will roast (like the beer can whole chicken method which is awesome). I had a gas smoker for a while but it took a whole cylinder of propane to run it long enough to do ribs or a turkey. It worked fine but made a big mess and was expensive to run. 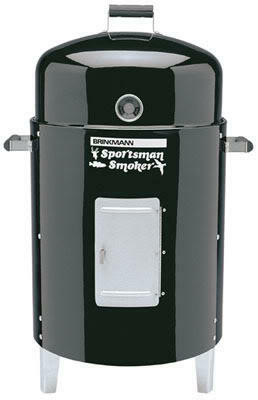 I just picked up a Brinkmann 50 lb. charcol smoker. I have yet to set it up, but I've got a whole book on smoking and bar-b-que'ing that I'm breaking out soon. ^^ Nah, you'll want to use dry chips (apple, cherry, hickory to name a few...). Steven Raichlen knows what he's talkin' 'bout!! You guys seem to confuse BBQing and smoking. I smoke various foods, but usually cold smoke. This gives a fantastic smoke flavour without cooking further. Use a flavoursome wood chip (old oak barrel, hickory etc...), dried leaves (orange tree etc..), herbs (rosemary, bay etc, dried or fresh). I place these in the bottom of the smoker and heat until they start to smoke. Then I add the foods on a rack over top and seal it all with a tight fitting lid. It can then be taken off the heat and left for half an hour or however long you like. I have seen metal garbage cans used as smokers, I use a large soup pot with a good lid. No need to buy smoking-specific tins, just another thing to store. Smoked venison fillet on smoked beetroot puree with hazelnut dressing and microherb salad. Damn good too. Served as an amuse-bouche. Packed full of flavour. Try smoking tomatoes for sauces, cheeses, various meats. Experiment with vegies too.